The local Council joined together with the parish women’s guild to hold a Church beautification effort with parish families doing the volunteer work. Preparation for the event began around March 1. Posters were put up in the Church narthex along with sign up sheets. 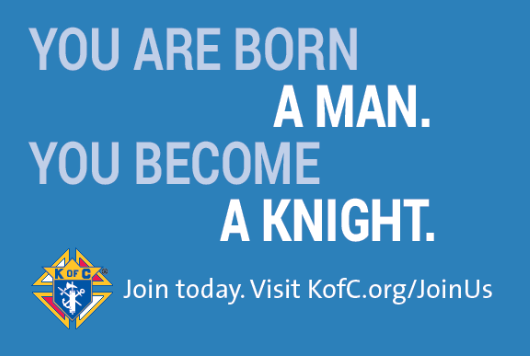 Knights talked it up at their monthly meeting, as did the women’s guild. Announcements were made from the pulpit. Families were encouraged to come and volunteer together. Water and snacks were purchased in advance. Mulch was purchased and delivered ahead of time in preparation for the day. A crew of two knights spent much of the week prior to the May 5 event limbing up trees and hauling away major branches. On the day of the event, 30 volunteers brought their rakes, shovels, wheel barrows, hand tools and spirit. Two young boys helped by hauling brush in their small wheel barrow. The volunteers transformed the church and rectory grounds which had not been thoroughly raked in about ten years. Volunteers cut brush, raked, spread 196 bags of mulch, planted flowers, watered, and enjoyed the comradery of the day. Volunteers enjoyed breaks with water and snack bars. A handful of volunteers finished the effort during the following week. The overgrown church entrance and presence on the main road were transformed into a welcoming groomed entrance. Lawns of the church and rectory offered a welcoming presence the next day to church goers, which was the day we celebrated the crowing of Mary on the side lawn of the church. Pictures of volunteers were placed on a poster in the Church narthex thanking all for their efforts. We put on a golf tournament to benefit Chelsea Donovan, a local Biddeford resident. She suffers from a rare disease, called Arcardi Syndrome. We held the tournament at Dutch Elm golf course in Arundel. There was much work done before the tournament to collect donations to help raise money for Chelsea. On the day of the tournament on the 16th there were numerous volunteers who donated their time to help in this worthwhile cause. This was the sixth year of putting on the tournament and we had the most players since we started. Placed 2 yards of mulch in planting areas around St Margaret’s Church Parking Lot. Last evening 12 council members of our Admission’s Degree Team conducted an Installation at Holy Martyr’s Church on Wednesday June 20, 2018. In order for our District Councils to continue to grow our council Admission’s Degree Team has stepped up a number of times to help our District Deputy and his council’s bring in new Admission Degree Members. Last evening was just another example of Team work between Council’s. Council 14246 brought 4 Catholic men to us from the Cathedral Of The Immaculate Conception in Portland to be installed. Present this evening was 25 Brother Knights. Included in this number was our District Deputy Ray DiDonato, Deacon Michael Augustino of Council 101, Seminarian Joe Moreshead of the Parish of the Holy Eucharist, Grand Knight Chris Sprague from Council 14246, Deputy Grand Knight Joe Mathew from Council 15791 and Benefits Agent John Burrell. The Honorer’s for this months Admission Degree were Seminarian Joe Morsehead, and Seminarian Joshua Guillemette. Following the installation fellowship was had by all in attendance. Seminarian Certificate Presentation From Council 15791. Our Council Program Director took time and worked up two Honoree Certificates from his home, on Thursday June 21, 2018. In sponsoring our Seminarians, we must stay connected with them, not only in monetary support but in many other ways. Last week it was mentioned to our Council Program Director that it would be nice to make our two NEW Seminarians the Co/Honoree’s for the Admission’s Degree whih was held on Wednesday June 20, 2018 at Holy Martyr’s Church in Falmouth. As part of selecting the Honoree for a Degree, the name or names of possible nominees are mentioned to the Program Director just like the nominee’s names are handled with the Knight and Family selections each month. We are very pleased and proud this year, to be able to financilly support two Seminarins. With their schedule’s the way they are, it was easier just to send their certificates by email. We look forward to walking with them in their journey toward becoming a Priest. Our Prayers as a council are with them each day. I REPAIRED GUTTER DOWNSPOUT AT ABOVE ADDRESS TO DIVERT RAIN/SNOWMELT AWAY FROM STRUCTURE AT ABOVE ADDRESS. TRANSPORTED RESIDENTS OF ABOVE ADDRESS TO AIRPORT IN PORTLAND, ME ON MORNING OF ABOVE DATE. HUSBAND TO UNDERGO AN ANGIOPLASTY IN SAN ANTONIO,TX ON JUNE 22ND WITH POSSIBLE CARDIAC SURGERY TO FOLLOW. Breakfast for Family Faith Formation training for family and parents by Father Nathan March, Peter and Laura Koch. Break by for the Family Formation Training for family and parents by Father Nathan March, Peter and Laura Koch.